The firmware for your network drive can be updated automatically or manually. Under normal circumstances, we recommend using the “Auto Update” function. You only need to use the “Manual Update” when prompted by our tech support staff to upload a specific file. Please note that the web user interface is not accessible during the firmware update. If you are not able to login, the system might be in the process of updating the firmware. If that is the case, please wait a few minutes and then try again. Current Version Shows the current firmware version of your network drive. If a new firmware update is available, the latest version is displayed here as well in red. Manual Update When prompted by our tech support staff, click Browse and select the new firmware to update the system manually. 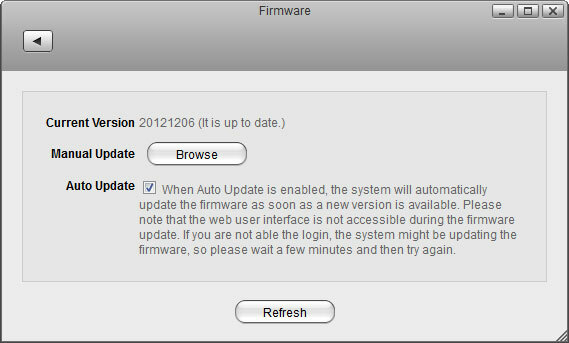 Auto Update Enable Auto Update for the system to automatically update the firmware as soon as a new version is available. Refresh Click Refresh to check if there is a new firmware update available.